BB Couture has a new ladies collection out! Hooray! I know I am on the edge of my seat all the time wondering when their next bunch of lacquers will come out and of course it's my joy to be able to share them with you! This collection is called the Ladies Formal collection. These are all matte/satin finish polishes. First up is Black Velvet, ooh luxe! This is more of a deep charcoal rather than a straight black. It's much softer and wearable than a true matte. It also goes on easily and levels well. I wore this under an Elixir glitter in my previous post. Three coats. This guy is called Chocolate Souffle which sounds just heavenly right? A color I don't know I would've chosen on my own but I ended up really fancy it. 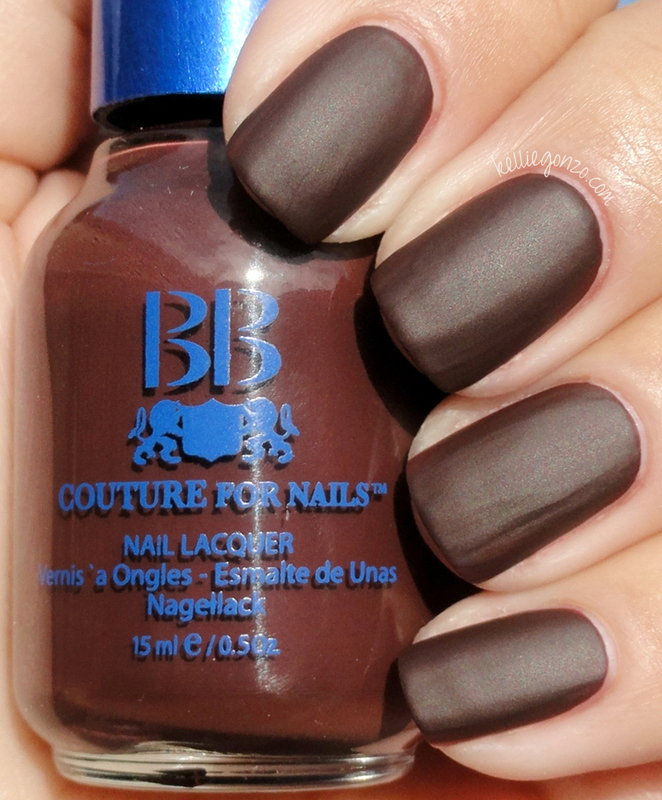 It's a rich reddish brown that looks nice and vampy on the nail. This one is more on the matte side, but it's still softer than the chalky mattes of yesteryear. Three coats here. 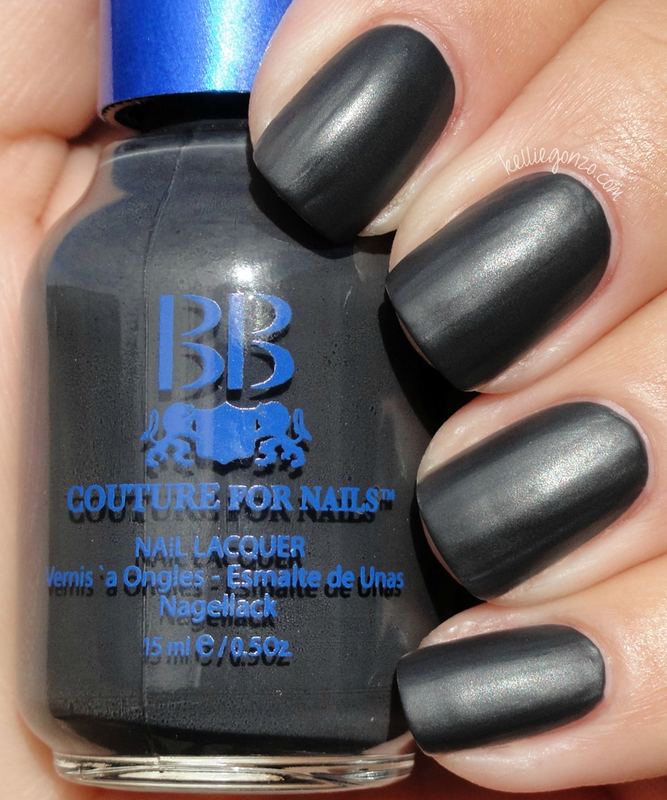 This one might be my absolute favorite matte polish ever. It's called Daring Debutant and it's a shade of purple that is reddish but also has a flash of blue in there which I can't figure out how they did, but it's awesome. It has a bit of a shimmer speckle in there that reminds me of stone. It's probably the smoothest satin matte I've ever used too. Ga-ga-gorgeous! Three coats. This is called Ruby Red High Heels. It's a pinky kind of ruby red, with a soft sort of speckle that's just barely noticeable. I am just really impressed with all these, they're so nice to paint with! Three coats. Here is Tiny Cocktail Dress, a lovely chic dark brown. I actually own way more brown polishes than I thought I did, so I must like them haha. I really like this one, it's amazing how sophisticated the espresso color looks huh! Three coats. And rounding out the collection is the fierce Uninvited. I totally love this, it's a fabulous matte red and really flatters on the nail. It dries a tad darker than the color in the bottle, like most of these. I used this one under a new glitter polish I just bout and it really enhanced it (post on that one to come soon). Three coats on this gal too. These are all real standouts in my collection, as mattes go they are incredibly easy application-wise, which is a HUGE accomplishment in my book. 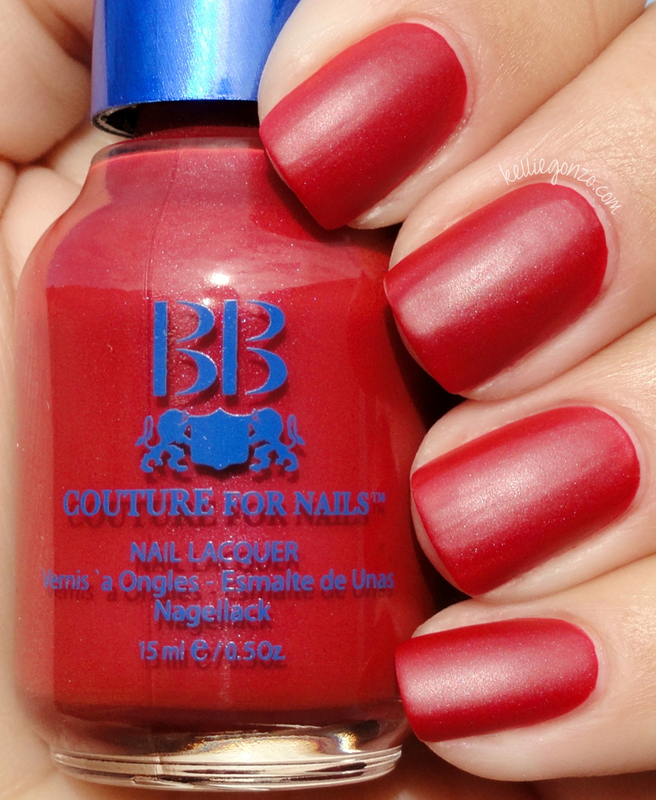 Bravo BB Couture! You can get these on their website www.bbnailpolish.com for $10.95 each. What are your thoughts on these?